I am finding something so fascinating, and I can’t wait to share it with you! It involves vision boards and shopping. Something like this happened to me about fifteen years ago that connected vision boards to shopping. See that leopard print coat I’m wearing? I purchased it 14 years ago. A year prior to that I’d seen a picture of a similar one in a magazine. I was making a vision board and cut it out and pasted it to cardboard. I really couldn’t imagine wearing a coat like that but it attracted me for some reason. Over the next year, I must have looked at that paper image a hundred times. 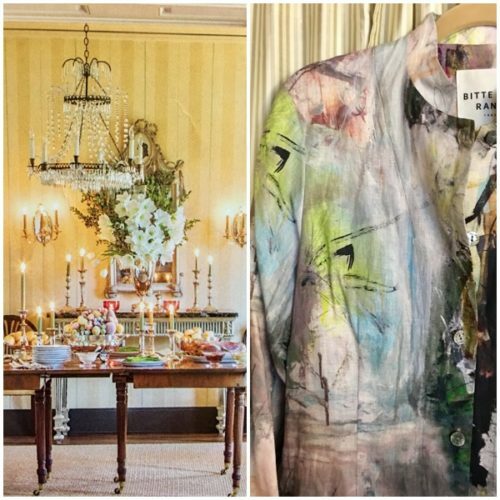 Then one day I was shopping with my friend Marj when I saw it in Nordstrom in Walnut Creek. It was kind of spooky! There it was on the rack. Was it meant to be mine? I still didn’t see myself as a leopard print person, but I took a courage pill and purchased it. It’s been a staple in my wardrobe ever since. 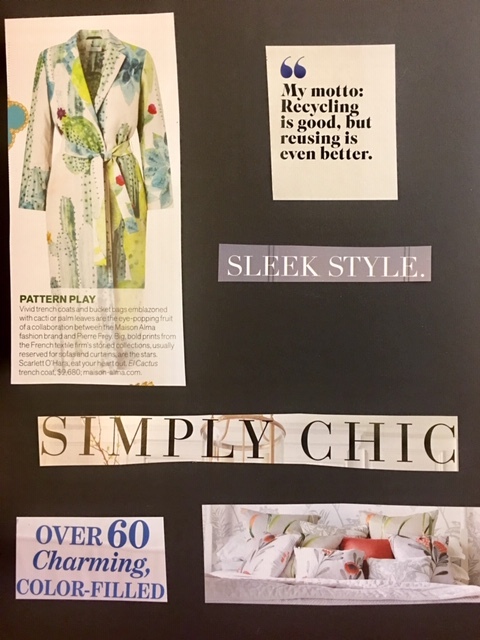 Near the beginning of the year (but sometimes later) I make vision boards. With an open mind, I go through magazines and rip out images or phrases that call to me. The idea is to arrange and glue these loved or aspirational images onto poster board and put it where you can see it. I like to make multiple “boards” on black card stock paper in 8-1/2″ by 11″ sheets. I get overwhelmed by a big board full of images. I need to break things down into smaller segments. This way I can slide each board inside plastic sleeve protectors and keep them in a three-ring binder and look at them that way. Sometimes the images and words group themselves together under themes: love life, work life, family life, spiritual life. And sometimes they just arrange themselves in unexplainable ways. Sometimes I remove one board from the binder, prop it into a frame and put it on my writing table. It could contain a message I need to take in repeatedly. 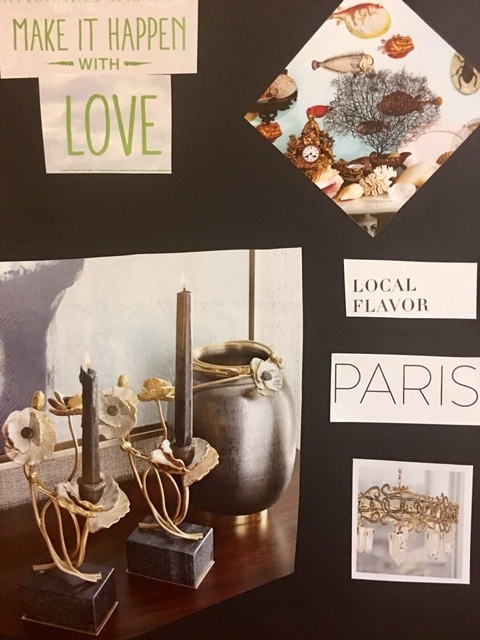 Vision boards soothed my sorrowful heart in the aftermath of grief and loss when Mom died four years ago. Sharing three of this year’s boards with you. Here are three of my 8-1/2″ by 11″ mini vision boards. Once you’ve collected images, it’s important to look at them and listen to what they may be trying to convey. 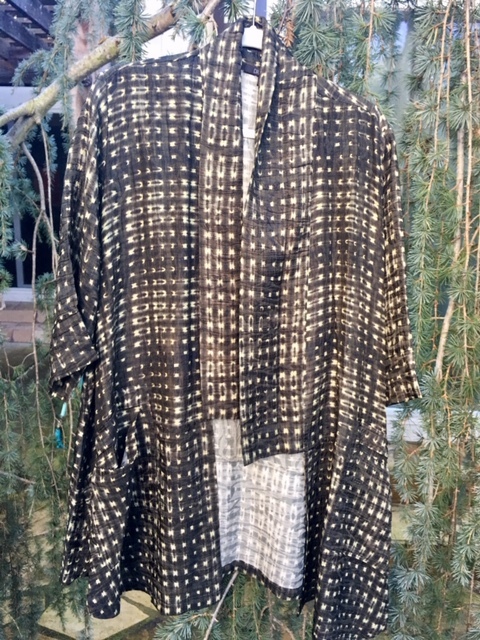 I’m crazy for that trench coat as it’s a classic shape, but the fabric pattern is so fun! I love the colors. It stretches me in that I often favor solid pieces in neutral colors. 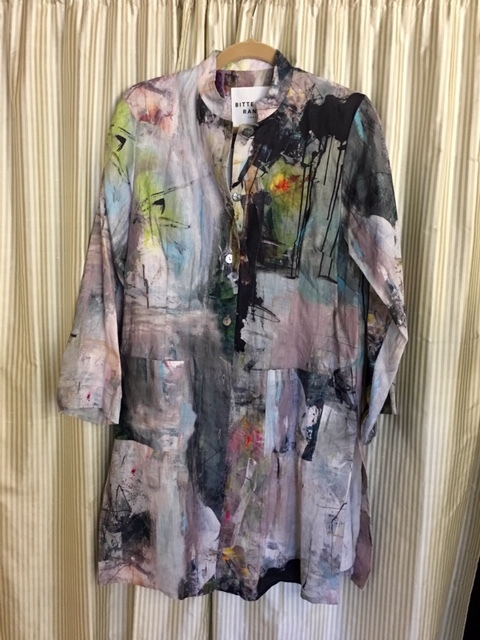 This is a playful print in multi-colors. I could never afford to actually buy this piece (it’s $2,680), but it makes me happy to look at. I really am into reusing and restyling things so I love that “motto” about recycling and reusing. I like “sleek style” and “simply chic” and wouldn’t mind if people described me like that from time to time. I’m over 60! I’ve entered my charming years! The colors and pattern in the bedding call to me as does the white background. It’s happy and bright. I proclaim this to be the year I am in full bloom. I’m open to discovering what that is. I think it’s about enjoying relationships; perhaps it relates to the fact that I’m becoming a grandmother and about to embrace a new role in my life. I’m open to new opportunities and figure I’ll recognize them when I see them. It’s just lovely. Those candlesticks and lit candles feel soothing. I love the luster on that open vessel. I’m crazy for the sweet flowers that ring the candles and the rim of the pot. It’s sophisticated pleasure. I am interested in listening to the stirrings of my heart. Anything I create I want it to be created with love. The fish wallpaper is delightful and quirky. It represents nature to me and how there’s so much variety in life. “Local Flavor” speaks to me. I want to enjoy more and more of the local flavor of Sonoma and Wine Country. Paris? Well, I got an urge to go to Paris this year! No, I’ve never been there so it’s about time, right? That crystal object glistens and beckons. It suggests possibilities and light. So tuck the image of those vision boards away for a minute. We’re going to come back to them real soon, but I need to tell you about a shopping trip with my friends and colleagues, Marj and Mariann. We meet every month and alternate meeting places. This month we were in Sonoma. One thing we do from time to time is shop together! Mariann and Marj have favorite places in Sonoma and I tag along. It’s funny how it takes friends coming to visit you to see what’s in your own neighborhood! I wasn’t sure about it right away, but it felt fabulous. These straight lines are great for my shape. I immediately thought about how I could wear it in the summer with white jeans and a T-shirt. It looked creative, made me happy, and came from a Danish designer. I have to admit to being attracted to anything Scandinavian because…well, it’s my heritage—what can I say! 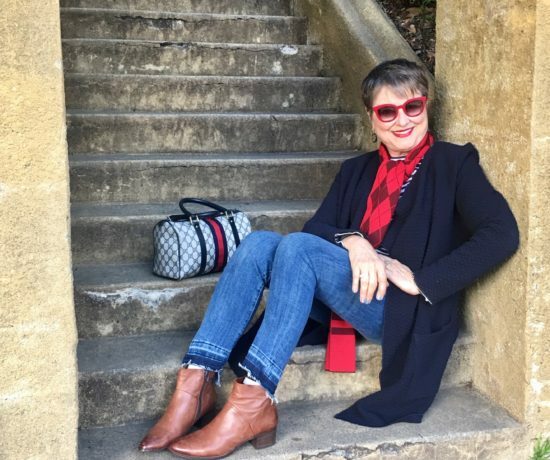 Having it on makes me feel like a woman who’s blooming into her 60-year-old charming self. Now, what does this remind me of? Hmm…perhaps a classic shape with an artisan touch? Where have I seen that before? Maybe a detail in Board #1? The colors make me feel joyous, sort of like a celebratory scene from my Board #2. How about that? I’m a prudent shopper so getting reinforcement from my vision mini-boards makes it a lot easier to say YES to the piece, especially if it’s different from something I’ve worn before. But what about Board #3? How does that figure in? Well, let me show you the other jacket I purchased. 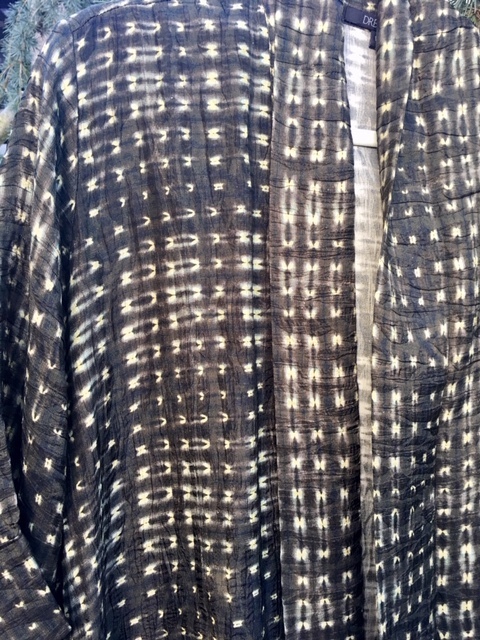 It’s a kimono style jacket with fabric created using the ancient Japanese Shibori method. It’s such a cool way of creating pattern in fabrics. I photographed it outside to try to show you the true color and have only slightly succeeded. 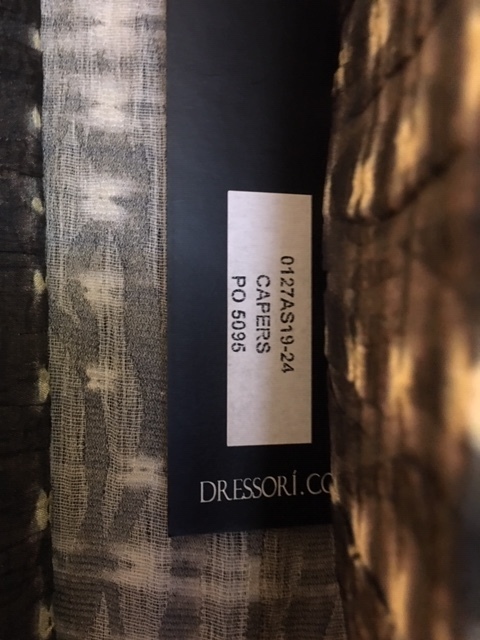 The color is called Capers which is right on. My friends loved it on me. It’s artistic, super comfortable, and when I walk with it on, I glide. It’s really different than anything I’ve purchased. Now, where have I seen something like this? I looked at the mini-board I made (#3) and saw the very quality of the picture with the candles, candlesticks, and open vessel. It’s sophisticated pleasure! 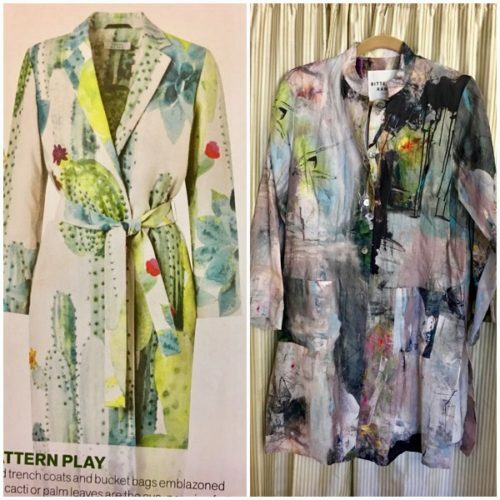 Can you see how the vision boards led me to these two jackets? Wait, Marj and Mariann led me to the store but these pieces passed the shopping YES test through the help of the vision boards. I can’t wait to finish styling these pieces so I can show you the finished outfits. In the meantime, I want to hear from you. Have you mentally pre-shopped like this by first creating collages of things you love? 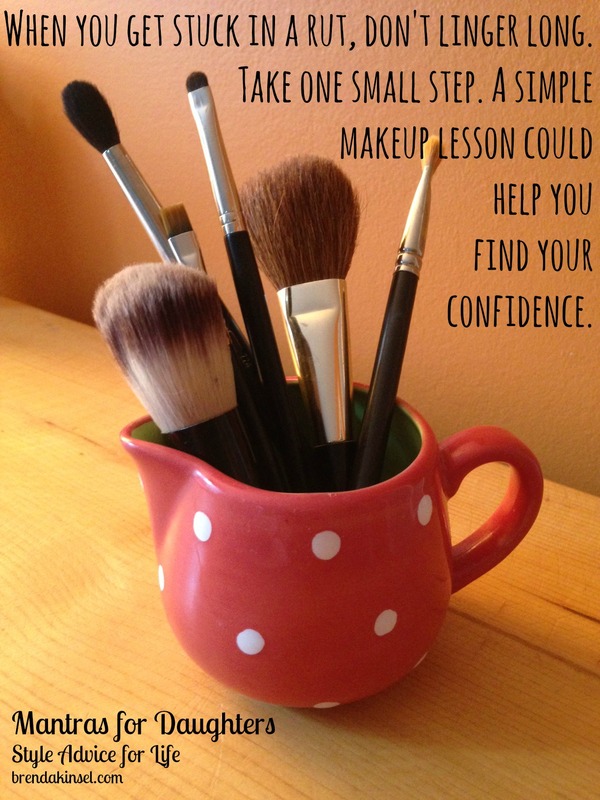 Has this worked for you? Does it intrigue you enough to want to do it again? Do share your thoughts and experiences! Great post Brenda. I do appreciate your thought process. I realized as I was reading this that I did that 2 years ago while looking for a winter coat. I had numerous pictures cut out of the coat style and shape that I wanted and left them where I could see them. When I came across the coat while shopping for something else, I just knew I had to try it on…. home it came. I am in love with the first coat you purchased! Simply stunning, and something I would love to wear as well. I am thinking that I should start the inspiration boards again to get on track. Thanks for the inspiration. P.s. you have also inspired me to check out a great pair of burgundy glasses frames. Fun to hear this, Diane. This is the first time that I saw images of things that aren’t clothes that ended up relating to clothes I chose! I need to do what you do about cutting out images of clothes and jewelry specifically. I used to do that every year and put them in my style binder (different from my vision boards) and it’s always beneficial! Thanks for the reminder! For me, this was your best post ever. The dining room scene in board #2 even brought tears to my eyes and is still affecting me as I write this. I wonder if it has to do with the sheer beauty of it or if actually because it reminds me of my mother who loved to set a beautiful table. Thanks, Brenda, for a wonderful post, I’m going to save it and do some more reflecting later. Wow, Elena, I’m so moved by the fact that you were moved! I’m guessing that it’s helping you remember your mother. Wish I was there to hand you tissues and to hear stories about her! Loved this post. I have never done a physical vision board (but I am going to now). I look at pictures and tuck them in my head and then go on the hunt. I have pieces that just spoke to me and remain in my “line up” for many years. From time to time I love to update the outfit giving the piece a brand new life. Those pieces are like special friends! It’s true about “special friends”. I love how the overall feel or qualities I want in my life spilled over to clothes without that being the intention. 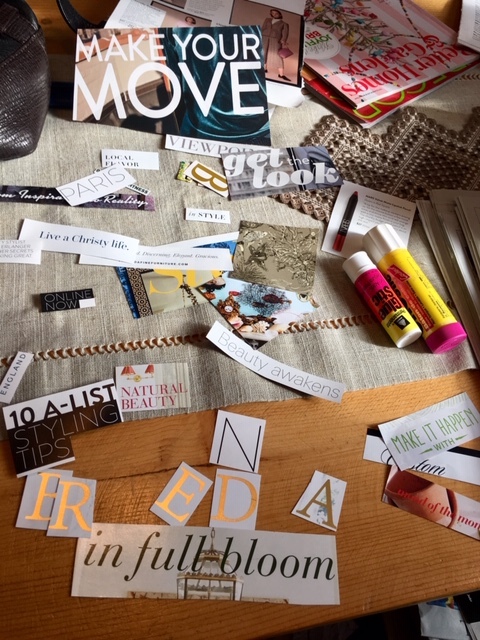 Have fun with your vision board! They always reveal interesting things! I love those jackets, and everything in your story of how you acquired them. 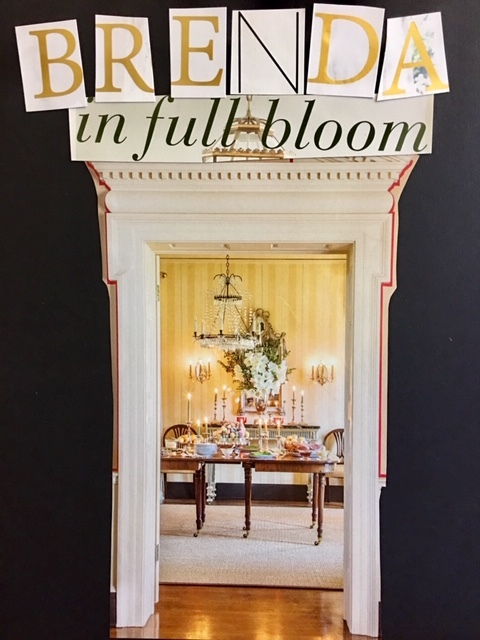 I did play with vision boards a wee bit, years ago. Pinterest replaced that as a way for me to collect images, sort of. I have so little free time/energy beyond work these days that pinning is more efficient, it seems! But the light is at the end of the tunnel–at the end of May I retire and right away, more or less, I will become a grandmother. I expect to reshape my life very fully, and perhaps making mood boards will help that process! In the meantime, one of my survival strategies for this last few hard months is intensifying the daily effort I put into creative dressing. At least I can do that. . .
Wow, you give me chills! 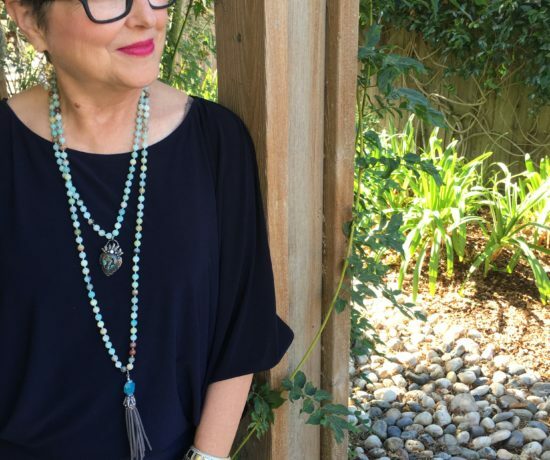 “The daily effort I put into creating dressing” is helping you through the most difficult times. I have used that through difficult times as well. I don’t have that in work, but I do have that in life–health stuff, family, loss. It always helps me when I’m in a situation that I feel powerless to change. Changing clothes and looking my best is my way of coping. Can’t wait to talk more after your retirement day and the day the baby is here! I have thought about doing an inspiration board but was overwhelmed by thinking about the large size of it. Well you have solved that by beautifully demonstrating page size ones that can easily be saved and referenced. I love both jackets and can’t wait to see how you will style them. I’m glad the smaller size makes it more possible. That made a big difference for me. Can’t wait to hear more about your process! LOVE the leopard coat on you! 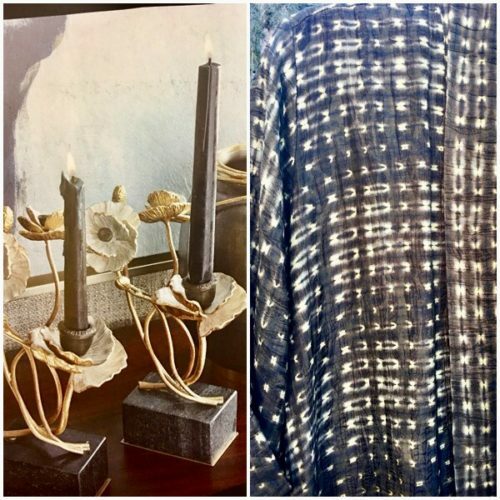 I use vision/mood boards for my clients for their interiors so they can see how the elements come together…makes sense for fashion, too. “That old thing?” Just had to say that about the leopard coat when I never actually say things like that out loud. 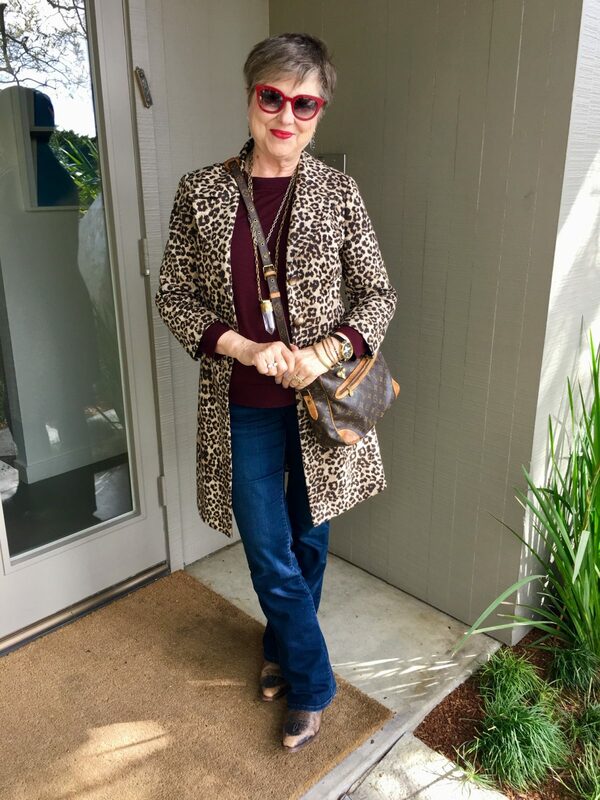 I’m amazed that the leopard coat still as loved today as the first time I saw it all those years ago. I’d love to see some of the mood boards you make for clients. I bet they’re awesome! Guess where I’ll be MONDAY! AT ARTIFACT with Two friends than Lunching on The SQUARE! They carry MY CAPUTI JEWELS!!!!! SO, Funny I saw your photo of the two friends and thought WHAT SHOP IS THIS?!!!! Then I read WHERE!! !AND LAUGHED OUT LOUD!!! YOUR purchases are SPOT ON! Oh my gosh! Amazing! Yes, I was tempted by a Caputi necklace when I was there. I got the leopard coat 14 years ago. Is that long enough that it makes it vintage? Oh, you’ll have tons of fun, I’m sure! Wish I could be a fly on the wall! Hugs to you, my friend! I have a binder with my mag cut outs and it helps me refresh on how to wear a scarf, combine prints, etc. Thank you for sharing yours!! That’s so cool!!! I need to refresh my style binder. I think I want to look at it in a broader way after reading your comment. Thanks! What fun to look at your journal! Wow, Connie, I still can’t quite imagine what it’ll be like but I’ll know around Mother’s Day! Sometimes I think that I can’t bear another moment of not meeting her in person. But of course, I can and I will. Pretty soon I’ll know what you’re talking about! So many things to love about this post! Becoming a grandmother… congratulations! It’s such a wonderful time of life. Paris! I’ve never been either, but I’m going in May and I’m beside myself with excitement! 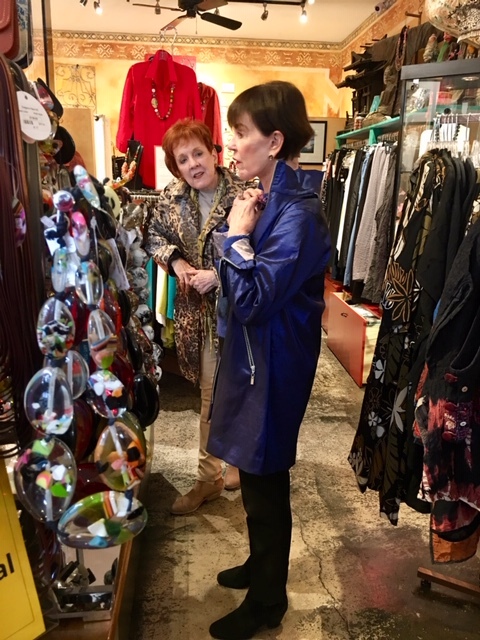 Shopping with friends… such fun! I haven’t tried making vision boards, but I’ve recently started collecting images on Pinterest that have really helped me define my style. Great ideas. I don’t buy magazines and won’t start now. I’ll need to work out how to do electronically. I have always had a binder full of ideas and never thought of it as a vision board until today. Thank you. And of course, I am so, so jealous you will be a grandma around Mother’s Day. Congrats to your family. Hope to see you soon?????? Could you please shop for me? Oh, I forgot, that’s exactly what you do. Love your jackets and must fine that store. Perfect for me, Love your vision boards I just know I’m not disciplined enough to do it. But I love yours. It is a great idea, especially for you. Wow, that is uncanny! I kept this post in mind when I attended a vision board making session yesterday. Can’t wait to see what this one inspires!